We often overlook barnacles as they are so small and look like part of the rocks themselves rather than individual animals. 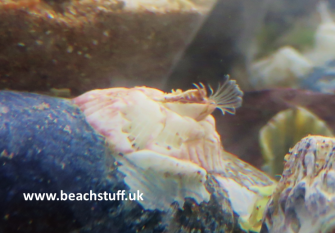 They are, in fact, tiny prawn-like animals which build a shell fixed permanently to the rock. They live inside their shells and never leave it. 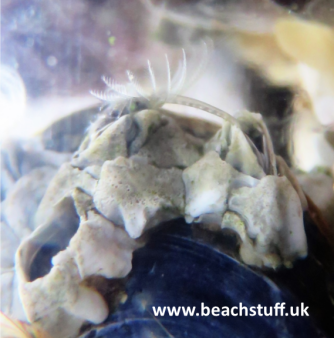 When the tide is in, they open a trap door at the top of their shell and stick out their legs to catch plankton. 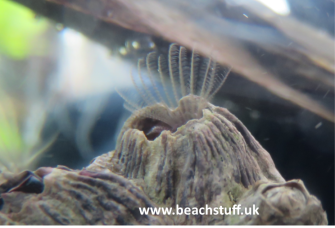 These are often our most easily recognisable barnacles are they tend to be larger being at least a centimetre in height in our rockpools in comparison with just a few millimetres that our other barnacles reach. Further out to sea, they can be even larger. They are purplish or grey in colour and tapered in a volcano shape. 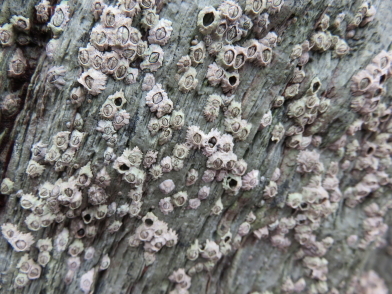 Their sides are often heavily ridged as can be seen in the photo on the left, and they are frequently found in overlapping groups. 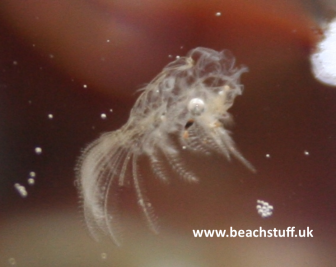 The photos below show the legs of the barnacle coming out to feed on plankton in the water. Press play to watch the clips. 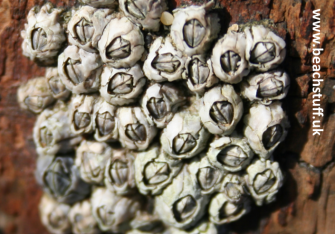 Like crabs and prawns, to which barnacles are closely related, barnacles shed their outer shell periodically and then ject it from their shell. 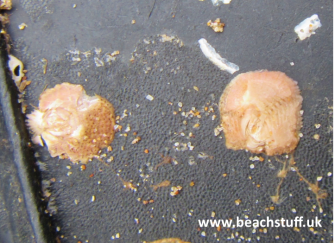 On the left is a discarded shell of a dark acorn barnacle which gives an indication as to what the animal looks like. 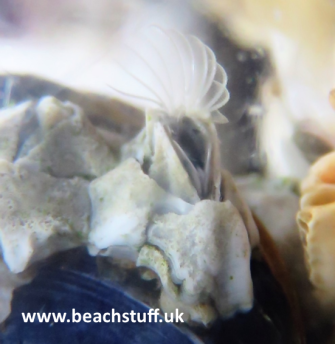 A second barnacle which is characterised by being larger than most is the crenate barnacle although it is usually not as common as the dark acron barnacle. 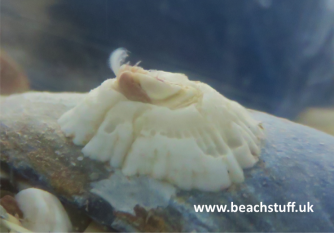 It is distinguishable from the dark acron barnacle by generally being bright white in colour and also by its lean to one side. 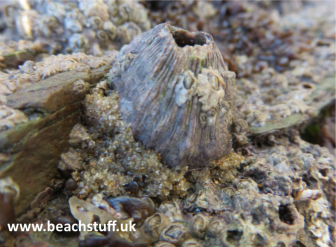 Common on the rocks around our rockpools are a number of smaller barnacles - much smaller than the dark acorn barnacle. 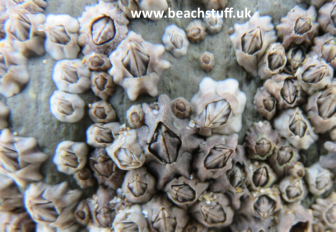 The photo on the left shows a dark acorn barnacle with the much smaller ones on it and around it. The general shapes of the four most common smaller barnacles that I see are shown below. 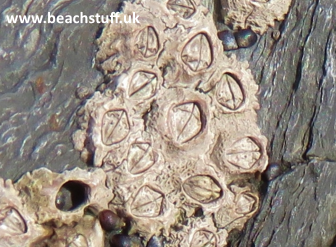 Generally, this is the most commonly found acorn barnacle on our rocky shores. It has a diamond-shaped trap door and is often grey. 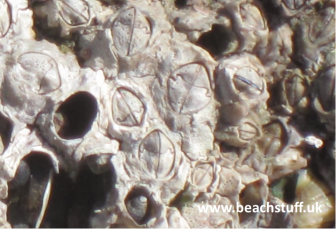 One distinguishing characteristic which cannot be seen when it is live is that the base is a permeable membrane whereas the bases of the other barnacles on this page are calcified (ie. a chalky layer of deposits of calcium). 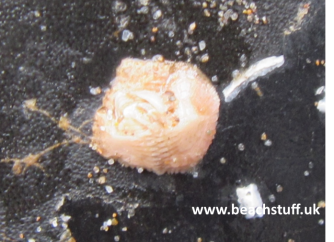 S Balanoides are the preferred barnacle of dog whelks who like to bite off their legs. 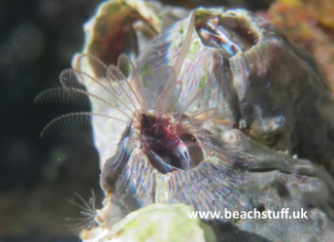 The barnacles themselves prefer colder water and thus it is feared that sea warming is having an impact on their ability to thrive in our waters. 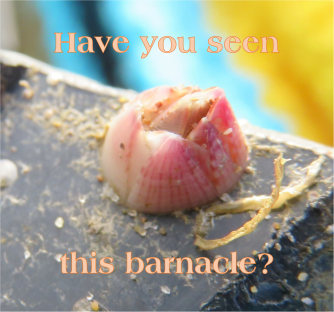 For barnacles found on the strandline, visit this page. 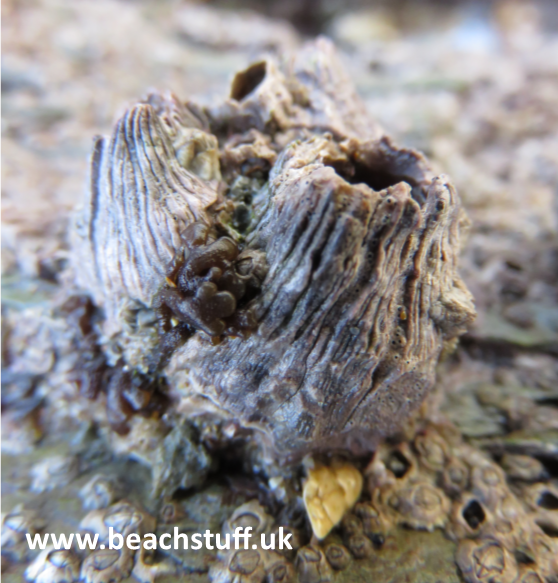 This is a common acorn barnacle on the rocky shores we see around our rockpools. 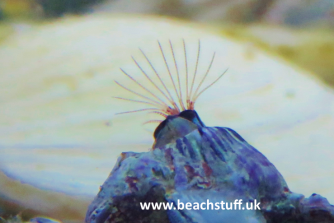 When its trap door is not closed fully, you can often see bright blue tissue showing through - as is the case with the barnacle to the right of centre in this photo. 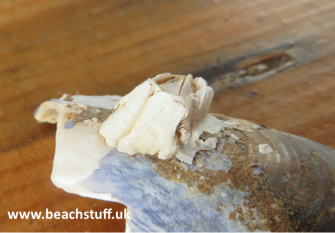 The trap door on this barnacle is kite-shaped and the blue tissue that can sometimes be seen through the trap door is paler than in the Poli's stallate barnacle. 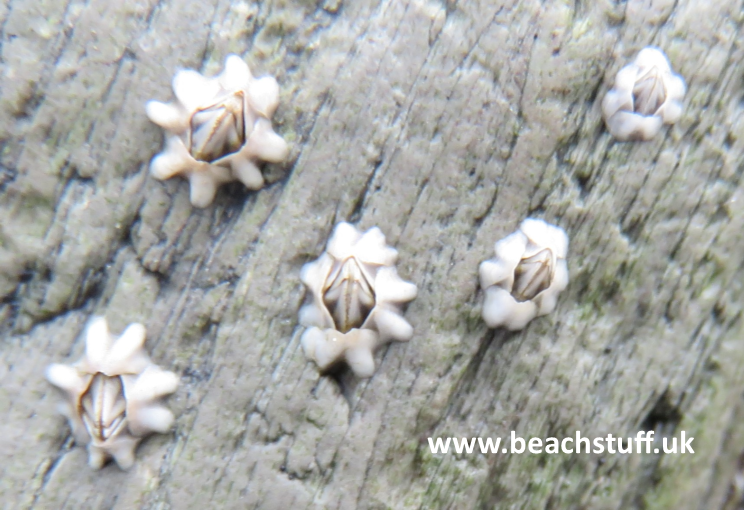 This is the smallest barnacle of those described on this page and is often noticeably whiter. it is not native to the UK but was accidentally introduced from Australia during the Second World War possibly from growing on the hulls of visiting ships or in the bilge water in its swimming larva life stage. Below left: E Modestus feeding by waving its legs in the water to catch passing plankton. Below right: mating taking place. This can only happen between two neighbouring barnacles. A barnacle with no other barnacles next to it will never be able to breed. 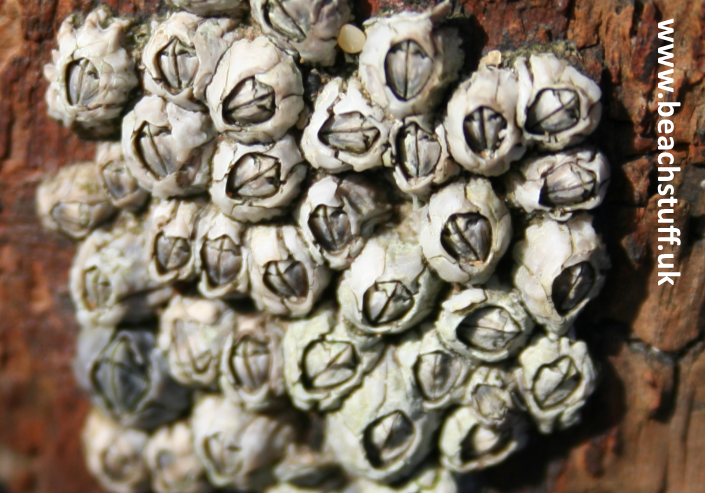 The barnacle is made of only four plates instead of the six plates of the acorn barnacles and has a much less defined conical shape. Even so, it doesn't really seem to deserve its very unflattering name. 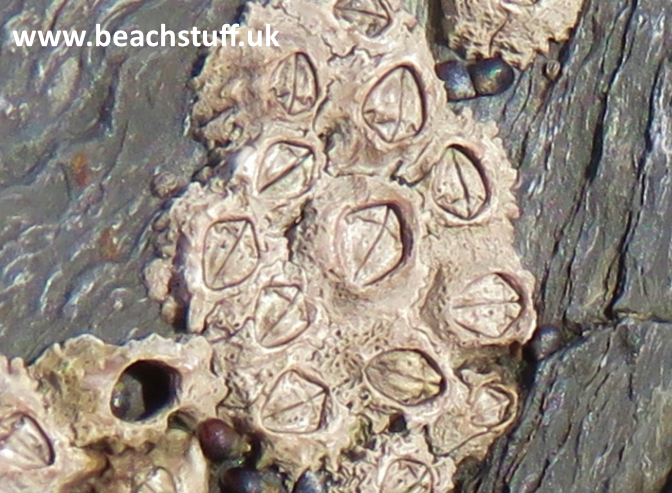 It is usually found much further out than the acorn barnacles.